Financial Settlements: Who Gets What? Please call on 020 8290 3985 for the Bromley team, 01732 446374 for Sevenoaks, 01372 750117 to talk to a family lawyer in Surrey and 020 7481 6393 for central London. We also have an Out of Hours number – 07931 121129. Of course, the primary concern of parents, and the court, should always be the welfare of any children involved. Questions involving care of children should largely be dealt with through mutual agreement as the court will only step in if the parents cannot reach agreement and an application is made for a child arrangements order. The major practical consideration following relationship breakdown is usually money. Namely, how will income and assets which previously provided for only one household be distributed to fund the two new households created by the split. Our family law team specialises in helping clients secure fair and favourable outcomes relating to finances on divorce. Our divorce lawyers can help you find the best ways to protect your money, assets and wider financial interests. Whether you are looking to settle a dispute over marital property, secure a fair agreement on maintenance payments, protect or secure pensions or satisfactorily divide a family home, we are here to work in your best interests. If you cannot reach a family agreement on child maintenance you will need to apply to the Child Maintenance Service and they will calculate and handle this payment. The law is ever evolving, both in interpretation and application. Ultimately, courts will look to split assets in way that is fair and takes account of any children involved. Factors considered include how much each party reasonably needs, their existing lifestyles, current and future earning capacities, age, health and other factors. It is very important that both parties make a full and frank disclosure of all of their respective debts, assets and financial interests, including trusts, pensions, company assets, properties, offshore assets, valuables and other sources of income. Courts take a very dim view of any failure to readily disclose relevant financial information. It may be surprising to learn that with the exception of the most extreme circumstances courts give little weight to the conduct of either party during the marriage. Their main concern is reaching a fair and practical distribution of assets. In many cases divorcing parties may be able to divide their finances without recourse to the courts. However, to achieve this both parties should be open to dialogue and disclose all necessary financial information at an early stage. 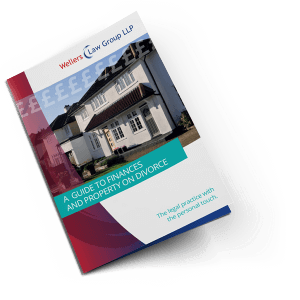 Wellers Law Group LLP believes in a collaborative approach to divorce and separation. We have a proven track record of achieving successful early stage and amicable settlements and may be able to help you negotiate a private arrangement which can keep the costs of divorce down. If such attempts are unsuccessful or unviable, we have the experience necessary to guide you through the court process. Maintenance Pending Suit: An order for regular periodical payments paid by one spouse to the other between the time of separation and the date of divorce. This is usually replaced by periodical payments on divorce. Periodical Payments: Regular maintenance payments to continue as long as the court deems necessary. Secured Provision Order: Periodical or other orders may sometimes be secured against an asset. SPOs are useful in cases where there is a concern that one spouse might not meet their obligations. Lump Sum Order: Requires the payment of a lump sum from one spouse to the other. Property Adjustment Order: An order to adjust shares in a property or properties. Important because the family home is frequently the largest asset owned by a divorcing couple. Pensions Order: Courts now have the power to split pension pots in ways they deem fair, in consideration that one spouse may have given up a career and pension building opportunities to look after the home and family. Clean Break: Any final divorce settlement that ends all aspects of financial dependence between a couple. h) in the case of proceedings for divorce or nullity of marriage, the value to each of the parties to the marriage of any benefit . . . which, by reason of the dissolution or annulment of the marriage, that party will lose the chance of acquiring. (Typically in relation to the loss of pension benefits). Whether you want to negotiate a private arrangement or require guidance through the court process for a financial settlement on divorce, Wellers can help you determine your options. Please call our Family Law solicitors for help or advice on 020 8290 7992 for our Bromley team, 01732 446374 for Sevenoaks, 020 7481 6393 for central London or 01483 284567 for our Surrey team. Alternatively email your enquiry to familylaw@wellerslawgroup.com. We offer a fixed fee, no obligation one-hour interview so that we may provide you with initial advice and suggest the options for your next course of action.